Little bulbs are one of the first blooms to show their bright faces in the spring, but as the season progresses it is flowering shrubs and trees that can make an impact. Last year I admired a splash of brilliant yellow in a neighbor’s garden. I was completely puzzled because it was too early for forsythia, but what else could be seen at the back of a big country garden from the road while whizzing past? It was a witch hazel, Hamamelis, sold as a tree or shrub because it will not get taller than 20 feet with a similar spread. The mature size will depend on the particular cultivar. 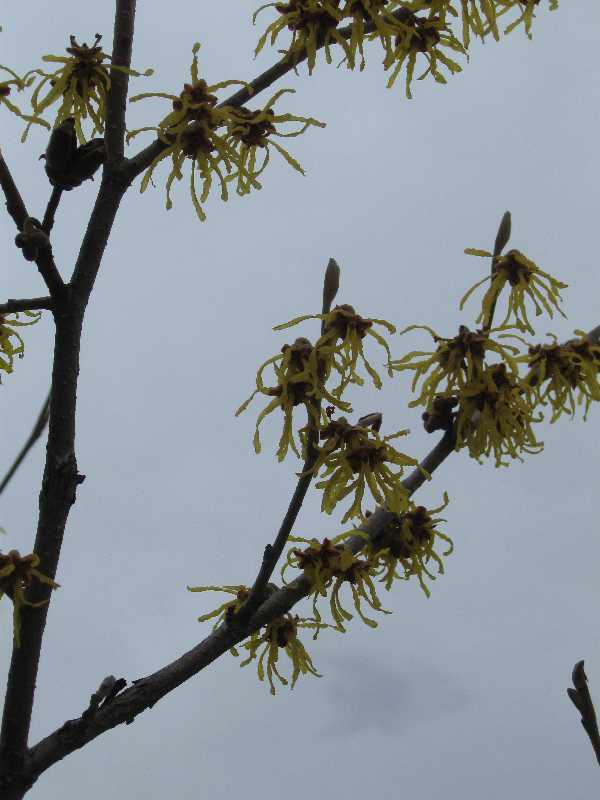 Witch hazel is considered a winter-bloomer because it flowers so early. Hamamelis virginiana is the native witch hazel, but most of the cultivars available at nurseries are hybrids of H. vernalis and H. mollis including ‘Arnold’s Promise’ and ‘Diane’. All witch hazels flower before the foliage with twirly little mops of color growing close to the twig. ‘Arnold’s Promise’ has sulphur yellow blossoms that can be see from a distance as I can attest. ‘Diane’ has intense coppery red blossoms that make a stunning impression. Both are fragrant and hardy to Zone 5. As a reminder, Zone 5 means winter temperatures down to minus 20 degrees. In actuality, gardeners also have to take into account their own microclimates, whether the garden is vulnerable to wind, or more protected, whether it is shady or sunny. Witch hazels prefer sun or partial shade and a moist, acid, well draining soil. They are sometimes planted for erosion control on stream banks which tells you something about their preferences. Obviously I haven’t noticed many witch hazels growing in our area, but there is no reason they could not be used more often. Another hardy spring blooming shrub with similar cultural requirements is Chaenomeles or quince. Given a sunny location and moist well drained soil they will thrive. They begin blooming in late April or early May depending on the cultivar. Quinces are available in several colors and produce yellow fruits that can be made into jelly. ‘Toyo-Nishiki sports flowers in shades of white, pink and red all at the same time. ‘Cameo’ is nearly thornless (unlike most quinces) and has large 4-5 inch salmon pink double flowers. ‘Crimson and Gold’ is a miniature quince, growing no taller than three feet with a similar spread. As promised, the flowers are rich crimson with golden centers. They also produce fruits in late summer that can be harvested, or left for the birds. They are hardy to Zone 5. 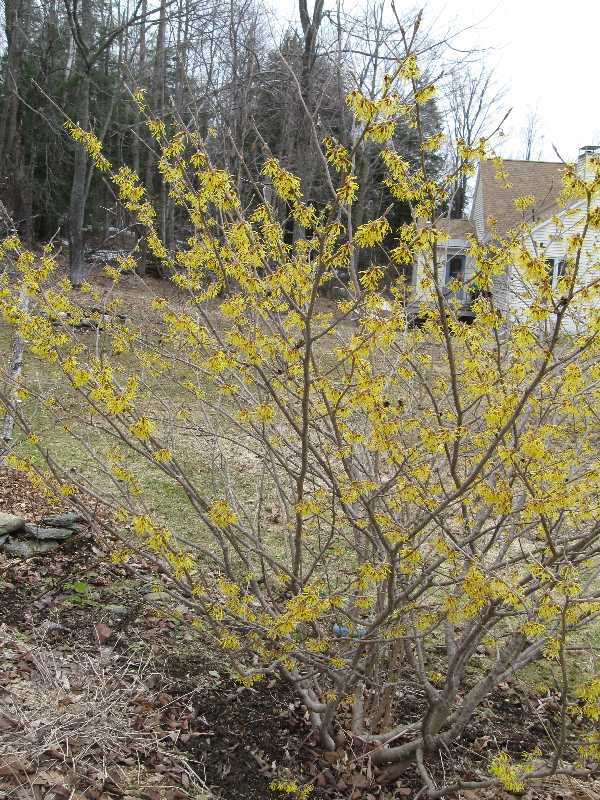 I cannot talk about spring bloomers without talking about forsythia, even though the old forsythia bushes growing at my house never produce much in the way of flowers. I don’t know if they are really too tender for my hill, or just a poor cultivar. I’d think about getting rid of them and putting in something more floriferous, but I haven’t ever gotten the energy to rip out the tangle I’ve got. Generally speaking forsythia is a vigorous, easy to grow shrub that can get quite boisterous. Its fountain of gold is a glorious spring sight. ‘Spring Glory’ is hardy to Zone 3 (minus 35 degrees) and can reach 6 feet tall with an even wider spread. ‘Vermont Sun’, one of the earliest forsythias, has large yellow blossoms on stiff upright branches. All forsythias are deer resistant. Another golden flowering shrub that I had never noticed before last year is Kerria japonica. The four foot bushes I saw had intense yellow little pom pom flowers that were blooming in May. There are varieties with single flowers. Kerria like full sun but can take some shade. A friend has kerria growing as a hedge right next to her shady road. She warned me that they were rampant growers. For me it is the lilac that means New England spring. There were old lavender farm lilacs at the End of the Road when we moved here as well as some ancient, but beautiful very tall white lilacs. I have planted ‘Ludwig Spathe’, a deep purple, ‘Beauty of Moscow’ with pink buds that open to white, and ‘Miss Ellen Willmott’ that has double while blossoms. All are wonderfully fragrant. I also planted ‘Miss Canada,’ a late blooming pink lilac that is not very fragrant, but I like the pink color. There are other pink lilacs: ‘Superba,’ that is not too tall and is fragrant; ‘Tinkerbelle’ and ‘James MacFarlane’ are single pinks and described as having a “unique spicy fragrance”; and ‘Sweetheart’ whose fragrant panicles are heart shaped. When planting any tree or shrub, choose an appropriate site, sunny or shady as the plant demands. Dig a generous hole and amend the soil with compost, and rotted manure if you have it. Plant your shrub so that it is at the same depth it was in the container. When the planting hole is half filled with soil around the roots give it a good watering. Continue filling in with soil and tamp it down firmly. Water well again. A two or three inch layer of mulch is always a good idea. Keep any new planting well watered for its first season. After that, these spring blooming shrubs can usually fend for themselves. Sources: Local garden centers; Fox Hill Lilac Nursery, 37 Lunt Rd, Brunswick, ME, 04011 www.lilacs.com; Rare Find Nursery, 957 Patterson Rd, Jackson, NJ 08527 www.rarefindnursery.com; Wayside Gardens, 1 Garden Lane, Hodges, SC 29695 www.waysidegardens.com. Hi Pat, good news that spring is making its way up to you. I have to say that Arnold’s Promise was much more fragrant than Diane, although her copper color is just gorgeous. Quince is a shrub I love also, I keep ours small with pruning, about 2 feet by 2 feet to make small coral buns that bloom for a very long time. You might want to take a chainsaw to the forsythias right after bloom time. They flower on new growth and might have stalled out with no pruning for many years. Frances, Thanks for comparisons of Arnold’s Promise and Diane. My sniffer is not what it was so I may go with Diane. Besides, I have a daughter Diane. I’d be glad to take a chain saw to the forsythia. It couldn’t hurt them. Pat I should have asked you first, but I just ordered a mock orange because I came across a patch of it in the “wild” near a cellar hole in Colrain and really loved the smell. Will it work in zone 5? Any special location needed? BJ – Mock Orange will do great in our climate. The fragrance is wonderful. It needs a good amount of sun – and plenty of room! It is a long lived plant as your ‘wild’ patch indicates, and will eventually need some space.